In 1933, Teitoku Memezawa,M.D. opened this clinic at Koiwa, placed in the east end of Tokyo. Toshio Memezawa, M.D. continued it as a clinic for the internal medicine and pediatrics. He re-furnished the clinic in 1994, and Hajime Memezawa, M.D. Ph.D. joined to work with him. Now we have expanded to have whole body CT, and Neurology and ENT(ear, nose) clinic. Here we would like introduce our clinic and demonstrate some news about neurology and ENT treatment. 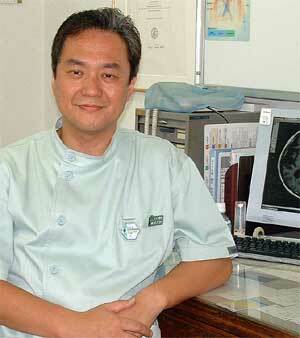 Director: Hajime Memezawa, M.D., Ph.D.
Thursday: CT/GI examination are avairable without any appointment until 17:00. Friday morning: dirctor is working at The Chiba-Hokuso Hsp. Nippon Medical School. The second Saturday of every month is not available. 1. Memezawa H. Zhao Q. Smith ML. Siesjo BK. Hyperthermia nullifies the ameliorating effect of dizocilpine maleate (MK-801) in focal cerebral ischemia. Brain Research. 670(1):48-52, 1995. 2. Zhao Q. Memezawa H. Smith ML. Siesjo BK. Hyperthermia complicates middle cerebral artery occlusion induced by an intraluminal filament. Brain Research. 649(1-2):253-9, 1994. 3. Kiyota Y. Pahlmark K. Memezawa H. Smith ML. Siesjo BK. Free radicals and brain damage due to transient middle cerebral artery occlusion: the effect of dimethylthiourea. Experimental Brain Research. 95(3):388-96, 1993. 4. Folbergrova J. Kiyota Y. Pahlmark K. Memezawa H. Smith ML. Siesjo BK. Does ischemia with reperfusion lead to oxidative damage to proteins in the brain?. Journal of Cerebral Blood Flow & Metabolism. 13(1):145-52, 1993. 5. Katayama Y. Kashiwagi F. Memezawa H. Terashi A. Effect of a prostacyclin derivative (OP-41483) and a hyperosmotic agent (glycerol) on brain edema and metabolism in cerebral ischemia. Japanese Circulation Journal. 56(12):1239-47, 1992. 6. Memezawa H. Minamisawa H. Smith ML. Siesjo BK. Ischemic penumbra in a model of reversible middle cerebral artery occlusion in the rat. Experimental Brain Research. 89(1):67-78, 1992. 7. Memezawa H. Smith ML. Siesjo BK. Penumbral tissues salvaged by reperfusion following middle cerebral artery occlusion in rats. Stroke. 23(4):552-9, 1992. 8. Folbergrova J. Memezawa H. Smith ML. Siesjo BK. Focal and perifocal changes in tissue energy state during middle cerebral artery occlusion in normo- and hyperglycemic rats. Journal of Cerebral Blood Flow & Metabolism. 12(1):25-33, 1992. Automatic appointment phone serveice is avalable from the 7:00 am everyday. This service is to take the number of the order. It do not point out the time.